4.5 stars. Have you ever finished a book and been left with an almost speechless feeling?This is how Unwind made me feel. I thought that the concept of kids being "unwound" (this is just a PC term for body parts being harvested/removed from unruly and unwanted kids) was an interesting and new story that I hadn't heard before. Unwinding results in the teen's death, but it was explained in the book as a chance to "live on" through other people.I expected that the kids would fight to stay alive. I expected the kids would go on the run to avoid the inevitable. 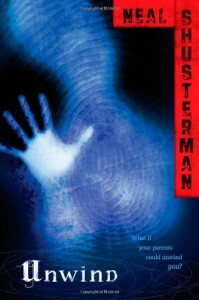 What I didn't expect was to be moved by the individual stories of the young adults that had to endure the process.Shusterman's writing style flowed from page 1. I found myself drawn immediately into the story. Each main character (Connor, Lev, and Risa) had a different story, and a different path to walk. This book took me on an emotional rollercoaster. It was quite possible that I felt just about every emotion there was to feel - from anger to warmth, then amusement, even some sadness... and then eventually hope.It will be quite some time before book 2 is released in this series, but I look forward to following these characters into the next chapter of their story, and their fight against unwinding.